Basic minimal (equilateral triangular) version of the "Shield of the Trinity" or "Scutum Fidei" diagram of traditional Christian symbolism. It is important to note that systematization is required for this Christian doctrine to be realized. Neither the word trinity nor any equivalent occurs in the Bible, however this Christian doctrine is logically derived from many statements spread throughout scripture. 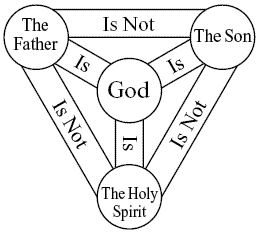 Trinitarianism (three in one) although not explicitly found within the biblical text however is implied in both the Old Testament and New Testament. Systematic studies of scripture under exegetical scrutiny by scholars have highlighted different nuances and aspects of syntax and grammar that demonstrate more than one person of God. The traditional view is that the Bible teaches that God is indeed one God but that there are three distinct nature's or manifestations to the world. The Holy Spirit is as to be accepted into a persons life upon faith in Christ's life, death and resurrection and as such is considered a part of God. The word for God being used in 1:26 in the original Hebrew is Elohim (אלהים, ʼElōhīm) and when that is used with the plural noun "Us" it refers specifically to more than two. Various other places also note, about two dozen times in the Old Testament alone, that there is only one God and in fact it states specifically that God does not know any other gods (Isaiah 44:8 ). It can be posited then that the Father, Son and the Holy Spirit are not separate god's as some believe because the underlying implication presented is that each is a part of one God. This is of course a consistent view held by authors of the Bible throughout. It is through the triune nature of God that we understand His will for us as He displays attributes which we understand through human reason and logic, ultimately allowing a philosophy to be formed of the nature of God. The ontological trinity is the trinity as how it exists to itself without regard to what has been created. The ontological trinity is conceptualized in the frame of mind that does not rely on the trinity relating to the world. The economic trinity are the relationships of the persons of the trinity to the world especially in the plan of salvation for humanity. The word used most often when describing the nature of God is hypostasis, which means the substance or essential nature of something,  and could designate more than one. God's hypostasis according to His written word clearly imply three distinct natures. However each may be unique with specific purposes and yet each hypostasis is equal because their constitution is of one God or Godhead. It is important to note that Jesus Christ or the Son does the will of the Father (Luke 22:42 ) and the Holy Spirit accords to the will of both (John 16:13-14 ). The creation of the universe and different kinds of life (Genesis 1:12-24 ; Romans 1:20 ; 1_Corinthians 8:5-6 ; Revelation 4:11 ). Divine revelation. The Father divinely revealed not only the Law to the prophets of the Old Testament but His love for the world through His Son (Revelation 1:1 ; Matthew 11:27 ). Salvation through His Son Jesus Christ (John 3:16 ). Creation and maintenance of the universe (John 1:3 ). Divine revelation from the Father to the world (Matthew 11:27 ). Salvation. Through faith in Jesus Christ's life, death and resurrection man can be saved (Romans 10:9 ; John 3:16 ). Creation and maintenance of the universe (Genesis 1:2 ; Job 26:13 ; Psalms 104:30 ). Divine revelation as well as a source of discernment (John 16:12-15 ; Ephesians 3:4-7 ; 2_Peter 1:20-21 ). Salvation through acceptance of the Holy Spirit into your life (John 3:6 ; Titus 3:5-7 ; 1_Peter 1:1-2 ). The Holy Spirit is also the source of Jesus' works (Isaiah 61:1 ; Acts 10:38 ). There have been many challenges over the past two millennium upon various beliefs that Christianity holds. The challenges in history presented will be the earliest known after Christ's death and resurrection, roughly 290 years after. These represent challenges towards the divinity of each specific hypostasis within the Godhead. A heresy arose in the fourth century around 318 AD in which Arius, the first to argue such a case, stated that the Son (Jesus Christ) is not in fact fully human and fully God but was a created being. He was formed out of nothing by the Father before the universe was made. Arius was a popular preacher from Alexandria, though possibly being of Libyan descent, but was strongly opposed by his bishop Alexander of Alexandria. Underlying Arius' thinking was the assumption that if Christ were to be fully human and fully God, it required two distinct gods. Under Constantine the Great's rule, the Council of Nicaea (Nicaea I) is convened and 318 bishops are in attendance and become one voice condemning the Arian heresy. The result is the Nicene Creed which many churches follow to this very day. Trinity in the Bible Got Questions? This page was last modified on 29 December 2015, at 04:17.